Much has been made about Tiger Woods' relationship woes in the past, with some of it coming back to the surface during his shining moment at The Masters on Sunday. Critics piled on after the golfing pro's fifth Masters victory, his first since 2005, noting how Woods admitted to cheating on then-wife Elin Nordegren while allegedly cheating with a number of women. But it wasn't all negativity when it came to Woods' off-the-course activities Sunday. Many took a moment to bring up his new girlfriend, Erica Herman, and how she has been seen by his side throughout this recent comeback for the golfer. The 43-year-old has been together for a little over a year according to The Spun and Herman can typically be spotted celebrating with Woods as he leaves the 18th green. 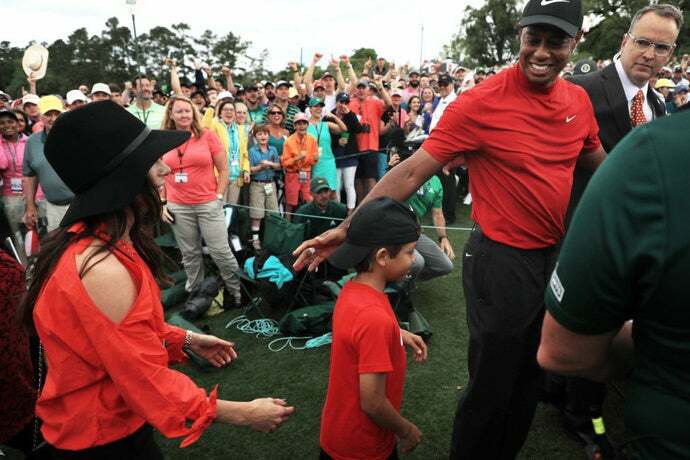 She was definitely present alongside Woods' son, Charlie Axel, as the golfer celebrated his historic comeback win at Augusta on Sunday. But according to The Spun, Herman isn't part of the golf world at all. The 33-year-old actually comes from the restaurant business and met Tiger Woods by running one of his restaurants in Juniper, Florida according to Golf.com. The pair started dating in 2017 and were spotted hugging during the U.S. victory at the Presidents Cup in October 2017 and first went public together in November. According to The Sun, some had once labeled Herman as a "gold digger" who "chased Tiger like a puppy." But much like the golfer himself, his return to glory has caused many to credit her with "saving" his life. That said, not everybody is on the side of Woods and his girlfriend just yet. Some still feel she's only in it for the attention, even using his Masters win to point that she wants her moment in the spotlight. "Why is Tiger Woods girlfriend trying to be before his children she is with him because she wants the fame," one critic wrote on Twitter. "Always trying to be in the camera with her ugly self. I do not like this heffer!" Some others brought humor to the situation, calling back to the golfer's past transgressions in order to make fun of his current love. Despite all of this, the couple seems happy and she has supported him during a comeback that nobody saw coming.